APM Project Fundamentals Qualification | APM PFQ training course at Southampton, Hampshire. Start a career in project management with this 2 days APM PFQ course. Options to train onsite for groups or at our training centre, contact us for a quote. The PFQ course offers a fundamental awareness of project management terminology and is for those wishing to gain a broad understanding of the principles of the profession. The course will provide you with the knowledge to make a positive contribution to any project and is particularly suitable if you work in a project team. No prior knowledge or experience is required for this qualification. If you have little or no project management experience then the PFQ course is suitable for you. However, if you have experience working in a project team and understand some project management terminology, then you may consider the PMQ. Please don’t hesitate to contact us to discuss your options. Download the PMQ self assessment spreadsheet. Attempt as many questions as possible, scoring your answer with either 1, 2, 3, 4, 5. If your overall average score is greater than or equal to 2.5 it would indicate you’re ready to undertake the PMQ. It’s only a simple guide, so if you have any questions once you’ve completed the assessment please don’t hesitate to contact us. The course is over 2 days with an exam on the afternoon of day 2. Your learning experience with us will be enjoyable. Project Management can be a dry subject, however, our very experienced trainers will inspire you. You will be encouraged to ask questions and join in discussions. There will be a maximum of 12 delegates on your course. Dress code is smart casual. Contact us for group discounts, either onsite or at our training centre. Click on the image below to read what has been said about our service, courses and trainers. Once you’re happy with the course outline, select a course location and date from the drop down lists. Click “Make enquiry button”, and complete the form. If you’re a training manager and have more than one delegate for the course please include this and any other information in the box provided. We will email you with a detailed acknowledgement of the course and reserve a place(s). In addition, we will invoice you and include our terms and conditions. On receipt of payment we will email joining instructions and a video link of how to find us. There are no pre-course materials for the course. APM Qualifications – Which qualification is right for you? APM Course options – Three courses to choose from. APM Brochure – download to view course options. 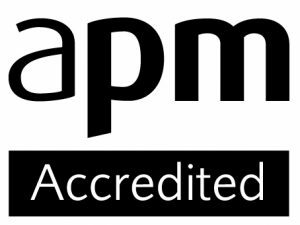 Video’s about the APM Project Management, PFQ, PMQ and PPQ accredited courses.